Run the installer that you just downloaded. When the installer completes, a message indicates that Node was installed at C:/program file/node/bin/node and npm was installed at C:/program file/node/bin/npm. 7.Hello World print in browse window. In product.js we will perfrom CRUD operation. Note: You may need to adjust the version number. 2.2.0 is the latest production version at the time of this writing. You can also open the MongoDB Interactive Shell in another terminal window to interact with your database using a command line interface. Refer to the MondoDB doc. Write all CRUD operation in Product.js. I want to share some ideas about MVC4. This is useful for all kind of beginners who wanted to get started with MVC4. I learned all these things & really it’s a nice experienced for me. It is useful in future also. I just explain you following things about MVC4 in short. ASP.NET MVC 4 (Model View Controller) is open source. It helps to reduce the complexity of the web application by dividing an application into three layers, Model, View and Controller. First Select New Project from the Start page or you can use the menu and select File -> New Project. 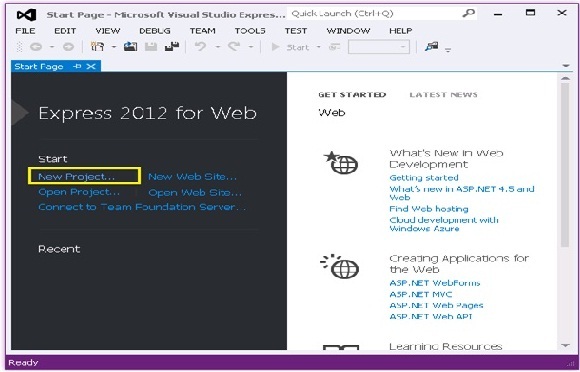 You can create applications using C# or VB as the programming language. 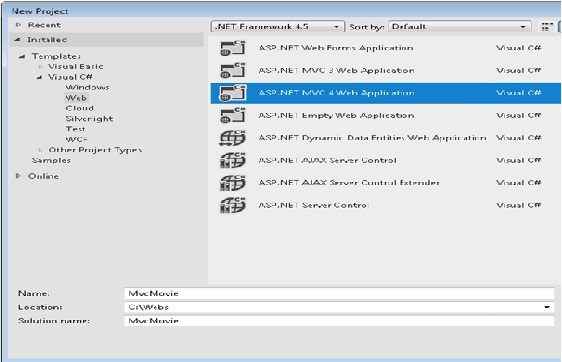 Select C# and then select ASP.NET MVC 4 Web Application. Give a name to your project and then click OK. 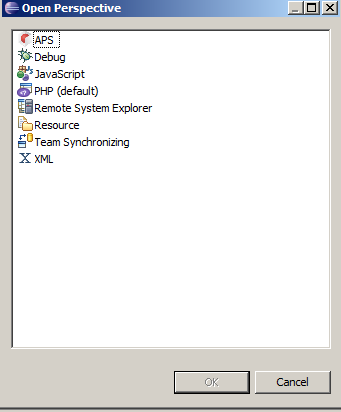 Select Internet Application & Leave Razor as the default view engine & click OK. It uses a standard directory structure and file naming standards. There must be 3 directories each for model, view and Controller. Expect from these 3 directories, there must have a Global.asax file in root folder, and a web.config. 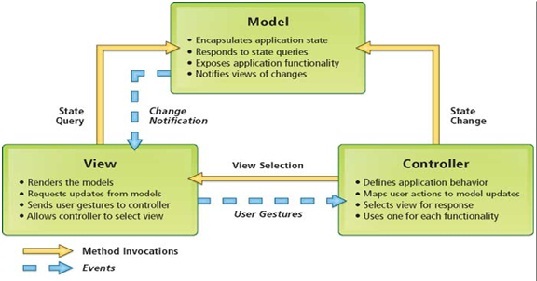 An MVC application consists of Model, View and Controller. Model: It consists of the method definations, data access logic and Business Objects. View: A view is used for user interface. Controller: It call views. It consists of the main application flow logic. If you know more about this then please share. Hello guys I hope you have been enjoying your life. Now lets get down to some serious business 😉 just kidding…. Now basically in the application life cycle there are 9 steps that we need to be considered or rather we can call them as events that we need to put some light on. Now before I explain any further let me show you some life cycle diagram that I have taken from Microsoft site. As you can see all the stages that I have mentioned above are in the diagram too. 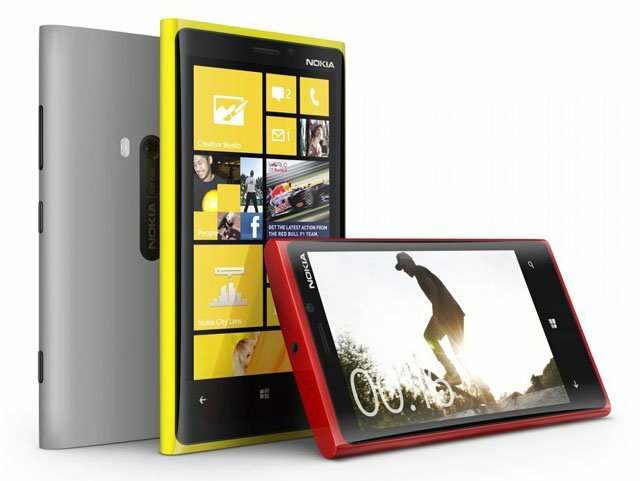 Let me tell you one thing, if you know how the application flows from start till end you will be able to understand all the Windows Phone very easily and quickly. The Launch Event: Now as the name suggests this event launches the new instance (instance means running the application from the start, that is having a fresh start of the app) of the application. The application can be launched by selecting from the list of application or if you have a tile of the app on the home screen or from a notification that appears on the screen, which will directly take you to the app home screen. As I have mentioned that the app should look fresh and new. There should not be any reference from the previously run of the app.When you run the app the Launch event gets raised. As the launching of the app is totally dependent on this event, and as we are here to give the perfect User experience, definitely we will not be doing any heave coding here that is in the handler of this event. Whatever you want to have the heavy loading that should be done in a background thread. Running: Well as the name says, this event is called when the app launches. Until and unless the user moves ahead or goes behind this event keeps running.Windows Phone apps shouldn’t provide a mechanism for the user to quit or exit. There is another scenario where the running stage stops, that is when the phones lock screen has been engaged. Although this can also be skipped if you have handled the application ideal detection, now in short I will try and explain the application ideal detection, this has been introduced so that the power consumption of the app can be controlled and we can make the app most power efficient. For more details follow this. The OnNavigatedFrom: Now this method is called whenever the user navigated from a page to nay other page. This may happen in the app or outside the app, that is within your app or when the user navigates away from the app. The important point here is you should store the information or you should save the page state as when the user returns to the app again and the page is no longer in the memory. In this there is one more property called as NavigationMode property which will determine weather you page is a backward navigation or not, if it is then you should not save the state as the next visit it will recreate itself. The Deactivated Event: This event is called when the user moves forward from the application, and this can be done either by pressing the start button on the phone or by opening another application. This event is also called when you have a chooser in place where, to get more information about it press here. Also is called if the device lock screen is enabled, unless application idle detection is disabled. Ideally speaking you should save all the data in the handler of this event so when ever you return, the data is not lost. The app is provided with the State object. It is a dictionary where you can store the app state information. Dormant: After the deactivated state the operating system will try and put the app in the dormant state. Now the beauty of this state is that, the application processing and the threads will be stopped, that is there will be no processing done for the app but still the app remains intact in the memory. The best thing is that of the app is reactivated from this state it does not need to re-establish the state as it is all preserved 🙂 🙂 ….. Isn’t this amazing one !! . But now if the user gets on opening new apps and there is not enough memory to run the app then the operating system will push the dormant state apps in the Tombstoned state to free the memory. Tombstoned: Now this state is really interesting one, in this state the app is terminated, its just that the operating system will save the information of the navigation state and the dictionaries that were populated during the deactivated event. 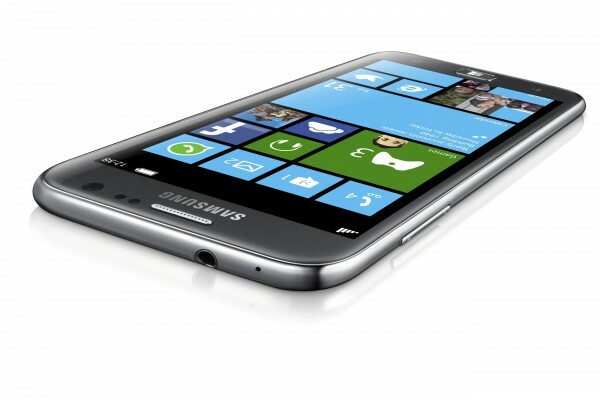 The tombstoning information is saved for five apps. If the user navigates back to the tombstoned application it will take that preserved information to restore state. 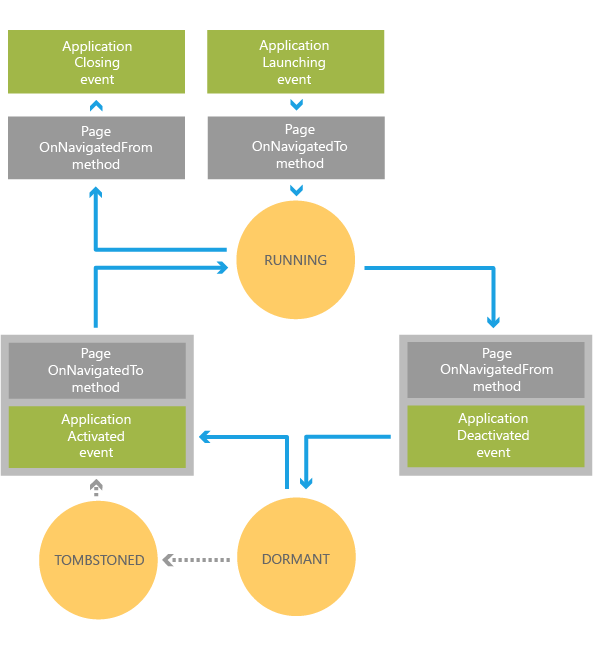 The Activated Event: The activated event is called when the app returns from the Dormant or Tombstoned state. You can check that in IsApplicationInstancePreserved property where you will see if its returning from the Dormant state or Tombstoned state. If its true its Dormant, and false then Tombstoned. Again as stated above that we have to give the best User Experience so we should not do any resource intensive tasks (loading from isolated storage or a network resource) in the activated event as it will consume time for resuming the app. instead have a background thread that will do all when the app resumes. The OnNavigatedTo Method: This method is called when the user navigates to the page. This includes when the user first launches the app or in between the app pages. This is used to check whether the page is the new instance or the one returned from Dormant or Tombstoned state. If its not a new instance naturally the page state does not need to be restored, but it is a new one then you should use the state dictionary to restore the state of the page UI. The Closing Event: This event is called when the user navigated backward from the main/home page of the app. This time the app is terminated and no state is saved. In this event handler you should save the persistent data that you will need through out the instances of the app. The operating system gives a limited amount of 10 secs to complete all the navigation page events, as the time exceeds the app terminates. So guys I guess you understood all the things that I have explained in the above article. Really guys if you have not understood anything out of it, please let me know so that I can help you understand it. Anything at all. I will keep you posted more and more. Hi Guys I am so sorry that I have not shown up since long time, but as I am here lets get a quick review on what all things are we going to learn and understand !! I will try and cover each module one by one and if possible also will give you the some “Hands On” and “Demos”, lets see how things fall in place. Will see you guys soon with a major content. Take care and have safe health. Application Packaging Standard gives a medium to package your Software-as-a-service (Saas) application. I got a nice experience of working with such packages and thought it would be good to blog it out! First off, I would like to create a scenario where you have a web application, which can be deployed to a panel which will be handling your application. So, in such scenario, the package, when deployed, will be working as per your requirement. In my case, I used Parallels Plesk Panel to achieve the purpose. I had to download it from the website, and install it on my local machine so that I was able to install the packages that I am going to develop. 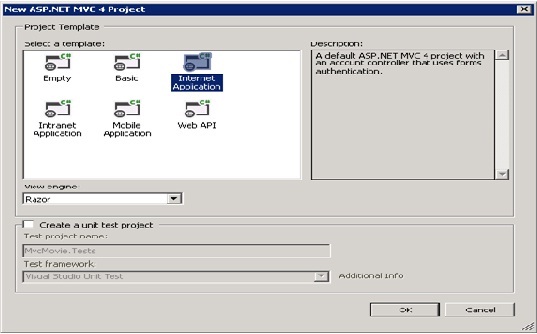 In my case, I was more than curious to have my IIS-based application on the Plesk panel, so I installed the Plesk panel with ASP.NET support as well as SQL Server Database support. Having created a scenario for installing and deploying the APS package, we will go through a short but important explanation of APS package. An APS package is basically a simple compressed package, with an extension .app.zip. It is important to note that creating a mere compressed package will not work; it should follow some standards which are provided at the APS website. It provides a set of rules to be followed by a package in order that the package will be APS compliant. I will just borrow some material from APS website as an illustration to the things I am going to explain. Following figure from the APS specification page clearly illustrates the package contents. I will go into details of each entity. This file is responsible for keeping a track of following elements. General information: application name, version, change log, etc. Vendor information: name, website, etc. Packager information: characteristics of package manufacturer. It also includes a very important field, called package uri, which must be kept unique as far as each version/release of the application is concerned. It also includes summary, category & description of the application and screenshots for the application. These things are covered under application information element. 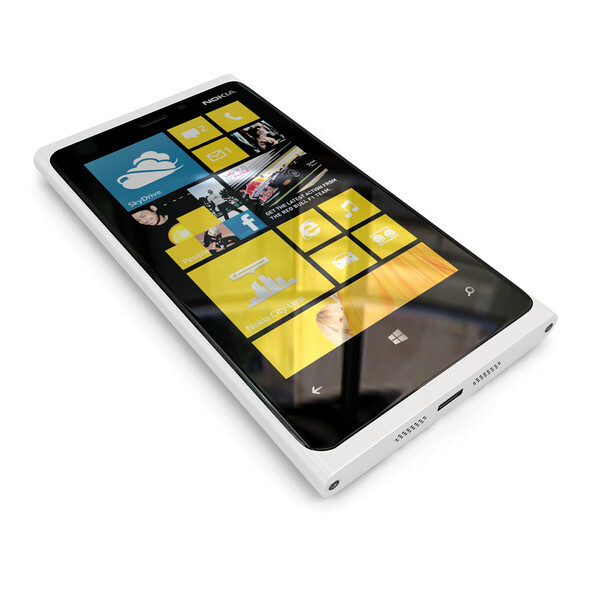 Each application offers some service to its users. These services are specified in the services element. There can be a license agreement, settings for service instance, control elements to be added to the user interface included in the services element. Settings for service instance can also be included in the services element. The APP-META.xml file follows simple xml schema architecture for the structure. This particular file is responsible for keeping a track of all the files and folders present in the package. More importantly, this file also conveys useful information about each file in the package as far as hash value, size of the file is concerned. This is very important so as to track the changes in each file as various packages can be issued for any given application. This folder involves all the scripts which are necessary for an application package to work. 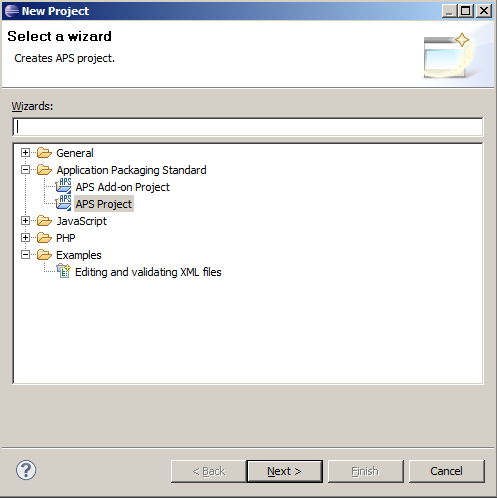 The important and very first file responsible for overall installation and functioning of the package is configure file. 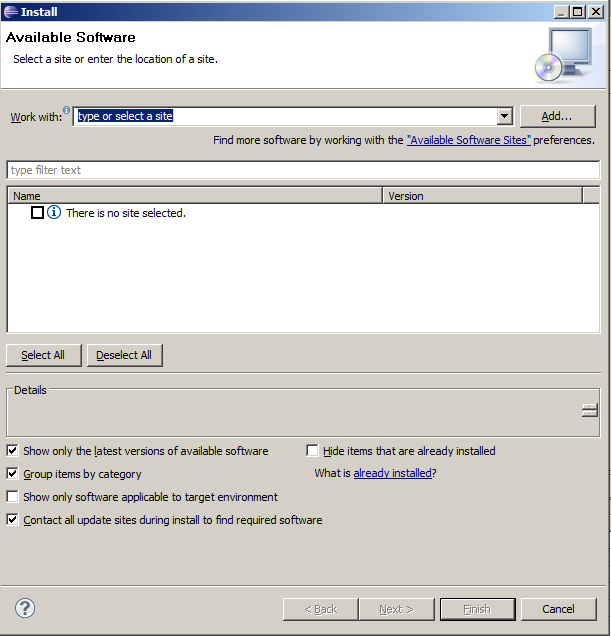 This file is included in the scripts folder, which is thereby invoked at the time of installation. You can also insert the SQL scripts in the folder as declared in the configure file. I will be taking your through a detailed package creation tutorial, where you will actually get an exposure so as to how to create a package which is APS complaint, more or that later. In the end, for a proper functioning of your package, the steps or the scripts are invoked by using files in this folder. This folder takes care of the branding of the package. All the icons and screenshots are packed in this folder. Icons, particularly for an application, which are visible on the panel where you will be uploading the apps, are redirected from this folder. The icons of packager, vendors are also present in this particular folder. 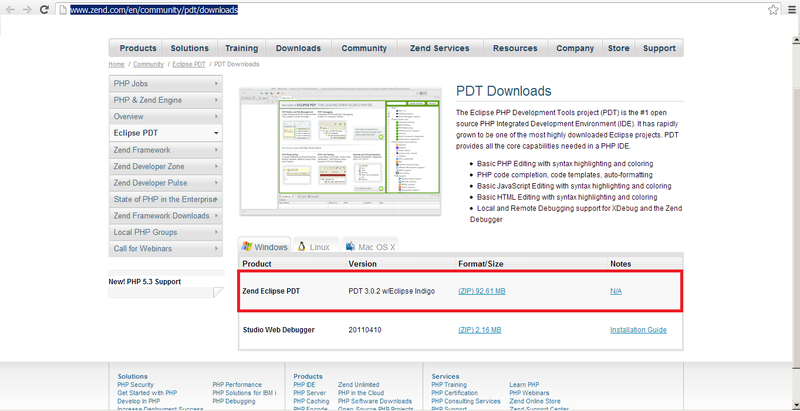 This is very crucial and important folder of the package, where you will put all your application files. Particularly speaking, considering an example of a simple IIS-hosted web application, the published files are kept here in the folder. This was all about a short and simple description about how the APS packages are and how they exist. In the proceeding posts, I will take you through the environment for APS packages in detail.